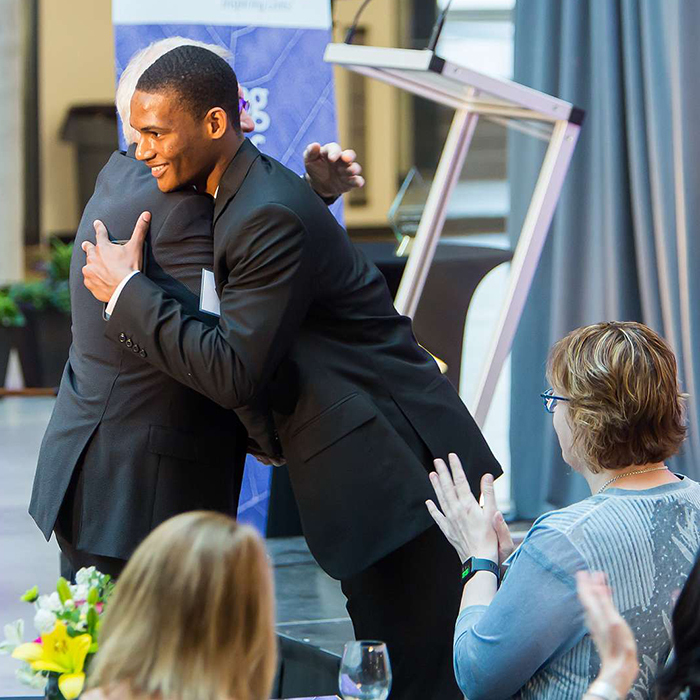 One of Laurier’s most generous donors and established volunteers was recognized with the Laurier Philanthropy Award during a May reception in the atrium of the Lazaridis School of Business and Economics. Peter C. Ansley was presented the award by John Bowey, past chair of Laurier’s Board of Governors, and Joseph Fo, the 2018 recipient of the Peter C. Ansley Basketball Award. “Throughout the year, your generous gift motivates me to press through fatigue and distraction in order to complete my academic tasks, whether it be starting on an assignment earlier or studying a few hours longer,” Fo said. In 2014, Ansley and his wife, Cheri, established the Peter C. Ansley Basketball Award in support of student athletes on the men’s varsity basketball team. A dedicated volunteer, Ansley has also held various leadership roles. He was appointed to the university’s Board of Governors in 2010 and is now in his third term as board member, currently serving as vice-chair. Ansley was also recognized for his support of Laurier’s Building Canada’s Best Business School fundraising campaign. In addition to offering personal financial support, Ansley served as chair of the campaign. He also inspired others to add their support, including motivating fellow class of 1966 alumni to raise more than $350,000. Laurier student Joseph Fo embraces Laurier Philanthropy Award recipient Peter C. Ansley. “Tonight, we are not just celebrating the impact you have had on our university in the past. We’re also celebrating the bright future we’re building together,” President and Vice-Chancellor Deborah MacLatchy said during the event. During the past year, 3,393 donors generously gave more than $7.4 million to enhance and expand Laurier and its student experience.